According to the New York Times, at least ten law schools have recently changed their grading standards in order to intentionally inflate student GPAs (grade point averages). How else can their students compete, after all -- surely not on the basis of their superior knowledge and ability. One school -- Loyola Law School Los Angeles, is simply tacking .333 to every student's GPA -- retroactively. Another name for this is "fraud." It's designed to hide the truth and deceive potential employers and the public. It's destructive. And it helps explain the low repute of the law profession, which in large part seems to be based on the twisting of words and meanings, and deception. I wonder where attorneys learned this? Contrast the attitude of the law school administrators with the following: I'm familiar with a case at a moderately decent engineering school, in which an entire class in a particular engineering course earned F's. They protested, pointing out that this set everyone of them back one full year since courses can't be taken out of sequence. The professor responded that if they were passed without understanding the course material, they would go on to design things that would fail and kill people. The Engineering College backed the professor (basically told the students to go to h*** with their complaint). Either these law schools see law as unimportant so this grade inflation doesn't matter, or else they simply see their mission as getting whatever they can for themselves and the public be damned. I suspect it is the latter. Note that most of our politicians are attorneys, and you'll begin to see why so much of politics seems based on looting the public. There's a kind of self-selection for scoundrels with low standards in all this. I tend to try to discourage my students from going into law schools for exactly these sorts of reasons. You can help promote liberty and peace! "We" at Unforeseen Contingencies strongly endorse this effort, and CAFMI in general. I've followed their acitivities a bit, and even communicated with CAFMI's director Mirsulzhan Namazaliev myself. This is a fine group of principled and uncompromising people, who are able to accomplish a great deal while "working on a shoestring," as we say in the States. If you have some spare dollars, euros, rubles, hryvnia, etc., we urge you to make a donation (tax-deductible in the U.S.!) to the Central Asian Free Market Institute (CAFMI) through the Atlas Economic Research Foundation, which supports CAFMI. Contact Erin.Grant@AtlasNetwork.org and 100% of your donation will be dedicated to CAFMI’s work in Central Asia. Even small donations will help. As Tom Palmer puts it, "It would be a decision you would not regret." 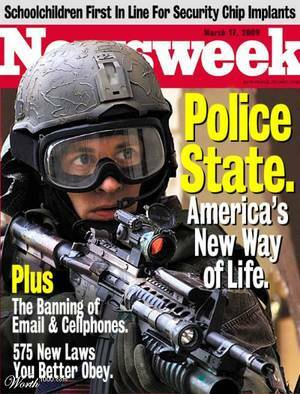 Another step on the road to a police state? It appears so. In 11 states it is now illegal (!?) to video or otherwise record a police officer at work. After all, it violates his "privacy." Here's an especially egregious example from the Washington Post, in which a Maryland National Guardsman who received a speeding ticket (which he accepted and paid) is now being prosecuted. He faces up to sixteen years in prison. If the police are doing things that shouldn't be filmed, the solution is for them to stop, not to prosecute citizens. If it is illegal to document police brutality and other wrongdoing, such behavior will expand and become institutionalized. My apologies: I'm still preparing my assessment of the dreadful course the Obama regime is trying to set for the United States. I'll get to it, and will argue that if successful, Obama will effectively introduce totalitarianism. But conditionals being what they are, I'm skeptical that Obama will succeed. Here's why. Barack Hussein is clearly competent at some things. Some of the law professors on Volokh Conspiracy were his students, and spoke highly of him. I met one of his students myself, and she convinced me he was a reasonably good professor. And clearly he is capable of running, or finding people to run, a strong electoral campaign. And sometimes he can give a good speech. But beyond this essentially academic stuff, he seems to be utterly incompetent. His bungling of the federal response to the oil spill in the Gulf of Mexico is astounding. I find it hard to accept arguments that blame for the disaster rests on the administration, but Obama seems at least as incompetent in organizing a response as Bush was to Katrina. Or consider health care. Despite the unfortunate fact that Obamacare passed into law, he has been defeated on health care reform in an important sense. Well over half the population wants it repealed, the CBO now argues that it actually worsens the national debt, and the health care train wreck has barely begun. This will become a millstone-around-the-neck for democrats. In foreign policy, despite (or perhaps because of) Obama's promise to sit down and talk Iran out of their nuclear weapons program, the program has accelerated, and Iran speaks in more belligerent terms than ever. Meanwhile, North Korea has sunk a South Korean ship and threatens war. Employment growth is effectively zero, expect for the hiring on temporary census takers. The national debt is soaring, and there's no reason to think it will decline. The federal government is exceeding the Bush administration in its suppression of whistle blowers. No wonder Obama's approval ratings are a shambles. His "leadership" is itself a shambles. At the end of Bush's tenure, the Republicans were ruined. Bush had (almost) singlehandedly entirely discredited the Republican Party and conservatism. Democrats were in the driver's seat. I suggested they had a great opportunity, but guessed they would squander it. 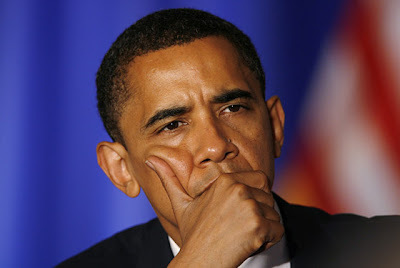 Well, President Obama has gone beyond my wildest beliefs in his squandering. In a way, he's the founder of the Tea Party Movement, an awakening to the idea of the importance of Constitutional government (although frankly George W. Bush and Hank Paulson really deserve the credit as founders, with their bailout scheme). In doing so, he's rejuvenated the otherwise dead Republican Party. He's turned the landslide victors of the 2008 elections -- the democrats -- into public enemy number 1, in much of the public's eyes. The republicans are ceasing to act like Bushites, and starting to act as though they actually believe in limited government. Maybe it will even become more than an act. Most importantly, he's awakened a sizeable portion of the public and taught them that liberty must be vigorously defended. Good heavens! Barack Hussein Obama is singlehandedly discrediting (left) liberalism, progressivism, and socialism? He's inspiring Americans to support Contitutional government and the rule of law? He's awakening people to the crucial importance of fiscal responsibility and free markets? Yes. Hooray for Obama! But, but, but... Obama as a hero of Unforeseen Contingencies? What??? Just one more unforeseen contingency! Oh no, another of my wild "over the top" claims? No, just reporting on what the "peace" activists themselves say they are doing. According to this IPS story, the next steps are an international campaign to de-legitimise Israel and isolate it. This kind of evil must happen, but it's hard for me to imagine any sort of soft landing in this. There's a substantial pack of these international "agents of change" at work, they are hell-bent on destroying Israel, and seem to have support in high places. No soft landing... I don't know what's ahead, but who is going to deal with Iran's coming nuclear weapons? Obama's campaign promise that he'd sit down and talk with the Iranians has gone nowhere. I'm doubtful he has any idea what to do -- he seems entirely incompetent when it comes to dealing with problems. If Israel decides it has to act for its own survival, then what? As an undergraduate I had a professor who had been a fairly high ranking officer in the USAF, particularly in intelligence matters, and had been a negotiator in a number of arms control discussions with the Soviets. He observed that while we are working on nuclear weapons reduction, we should note that countries don't seem to attack nuclear armed countries...deterrence works. No Arab state seems anxious to directly threaten Israel's existence, for obvious reasons. But these "civil society" "agents of change" have no such constraints. They are free to back Israel into a corner and threaten its existence, and it's extremely difficult for Israel -- or anyone -- to stop them. Backing Israel into such a corner will to a catastrophe, these thugs are gleefully doing it, and much of the word seems to be falling in behind them. I'm increasingly of the belief that America's "news media" do not report the news, but rather create stories, often fictional, in the interests of serving particular clients or patrons. This isn't something I often mention, since it smacks of conspiracy theory and is usually hard to really document. The British Medical Journal and the Council of Europe both just issued reports documenting that WHO intentionally grossly exaggerated the H1N1 threat, and that the WHO officials who did it are in the pay of pharmaceutical companies that produce H1N1 vaccine. My source? Al Jazeera English Edition. Since I'd not heard this elsewhere, I checked the stories reported on Yahoo News -- no mention. So I searched Yahoo News for H1N1 and found a host of new stories reporting that WHO is warning that the pandemic is continuing. This Reuters story is typical. Note there's no mention of the charges from the British Medical Journal and Council of Europe, and the story itself is almost devoid of news content. It simply reminds us to be frightened of what might happen with H1N1. Of course, maybe Al Jazeera is wrong -- so to be sure I checked the Council of Europe website and found the news release (on a secure webpage, mysteriously). For some reason, the charge that the WHO intentionally created the H1N1 panic (this is what the Council of Europe report alleges) isn't newsworthy in the United States. However, the continued WHO warnings that we are not out of the woods yet with the "pandemic" is newsworthy. Over the next days I'm going to document some other news that "isn't newsworthy." If readers wonder whether I've gone crazy when I talking about sinister stuff no one has ever heard of, keep this example of media dishonesty in mind. Unfortunately, I'm currently unable to upload IDF video of the combat on the Mavi Marmara between Hamas supporters and Israeli commandos. But you can find it on this IDF webpage. In the video I've seen, the Hamas supporters repeatedly club downed Israelis using high overhead swings. Eventually one Israeli commando manages to drive some of them off with a paintball gun -- a paintball gun! I watched the video repeatedly, simply astounded that the Israelis would equip their troops with such a useless device. Another Israeli finally uses a handgun (or so it appears) to put a stop to the attacks. It's a chilling and brutal video. I cannot understand why the Israelis were not shooting long before... it was certainly warranted. All this is by way of introducing this interview from Jerusalem Post with the soldier who was, I presume, one of the men I saw in the video. When he landed on the deck, two Israelis had already been shot, and a third had had his skull fractured. He says, "These were without a doubt terrorists. I could see the murderous rage in their eyes and that they were coming to kill us." His account is well worth reading. On the other hand, here's the way the pro-Hamas "FreeGaza" group told the story: "Under darkness of night, Israeli commandoes dropped from a helicopter onto the Turkish passenger ship, Mavi Marmara, and began to shoot the moment their feet hit the deck. They fired directly into the crowd of civilians asleep. According to the live video from the ship, two have been killed, and 31 injured. Al Jazeera has just confirmed the numbers. Streaming video shows the Israeli soldiers shooting at civilians, and our last SPOT beacon said, 'HELP, we are being contacted by the Israelis.'" I see... so the passengers clubbing the Israelis were asleep. Hard to believe. The video shows FreeGaza is lying. So far as I can tell, the Free Gaza group is making war on Israel. They are proxies for Iran, Syria, and the rest of those who are working to obliterate Israel. The next ship, the Rachel Corrie (ugh) is en route for Hamas. It has to be stopped. In a sane world, Israel could simply sink the damned thing and not risk any of its troops; unfortunately, we're in a world that's in the grip of dangerous lunatics, and the mainstream media is at their service. "We" at Unforeseen Contingencies wish the Israelis and IDF safety and success in this nightmarish situation. This news, at least, seems not to have been suppressed. The Turkish organization behind the Hamas flotilla is connected with Islamic terrorism. It's important to understand that this flotilla effort is not about relieving human suffering -- it is about opening Gaza so that weapons can be shipped in. "Free Gaza" calls for an end to Israeli occupation. Since Israel does not occupy Gaza, what can they mean other than the Israeli occupation of Israel? Israel withdrew unilaterally from Gaza in 2005. In Palestinian parliamentary elections in 2006, Hamas came to power. Hamas then staged a 2007 coup and ejected the Fatah government from Gaza. Since then, Hamas has purged Fatah supporters by violence. Hamas turned Gaza into a firebase from which thousands of missiles have been fired into Israel, mostly at civilian targets. It is only after these events that Israel imposed its embargo (which is also imposed by Egypt). In June 2007 Hamas also entered Israel and kidnapped an Israeli soldier, Gilad Shalit. He has been held hostage since then. Repeated requests by the Red Cross to visit him have been denied by Hamas. Hamas is a band of murdering thugs, at war with Israel and working towards imposing their brand of Islam on whomever they can. Their supporters in "Free Gaza" and IHH are actively working to make it possible for them to get heavy weapons. They had better be stopped.